When I am Playing with My Cat, How Do I Know She is Not Playing with Me? by Saul Frampton offers a celebration of perhaps the most joyful and yet profound of all Renaissance writers, whose work went on to have a huge impact on Shakespeare, and whose writings offer a user's guide to existence even to the present day. In the year 1570, at the age of thirty-seven, Michel de Montaigne gave up his job as a magistrate and retired to his chateau to brood on his own private grief - the deaths of his best friends, his father, his brother, and most recently his first-born child. But finding his mind agitated rather than settled by this idleness, Montaigne began to write, giving birth to the Essays - short prose explorations of an amazing variety of topics. 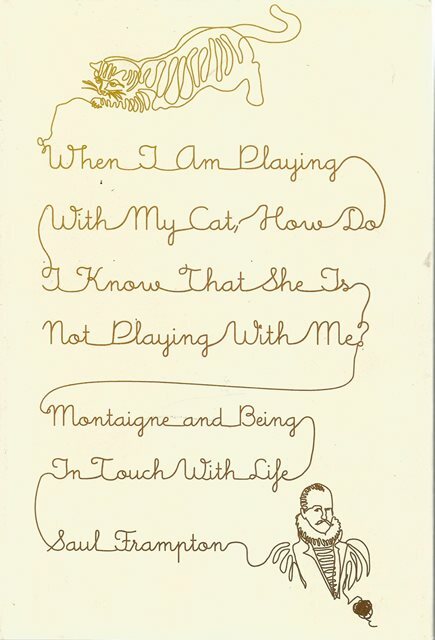 And gradually, over the course of his writing Montaigne began to turn his back upon his stoical pessimism, and engage in a new philosophy of life, in which living is to be embraced in all its sensory, exuberant vitality - the smell of his doublet, the pleasures of friendship, the intelligence of his cat and the flavour of his wine.